General Motors (GM) is developing an electric battery-powered car for 2017, with a plan to go after Tesla and Nissan for the most efficient electric car in the history of automotive transportation. Some people are excited, while others are skeptical—but if GM can pull it off, that would be a major coup for the carmaker. So get ready; here comes the Bolt! Is the Bolt a Reality or a Fantasy? The Chevy Bolt is a new, longer-range GM electric vehicle that has been met by cautious cynicism among auto executives. They can’t believe that GM can make a pure electric vehicle with a range of 200 miles at $30,000, with no other enhancements (such as a range-extending engine). Let’s put those thoughts to rest. GM has a battery production partnership with LG, the South Korean battery maker, as well as a factory in suburban Detroit, and huge strides have been made in the area of battery capacity. Of course, cars like the Bolt are still 2-3 years away. The Bolt, which at this point is only a concept vehicle, is slated to be sold in all 50 U.S. states in 2017. For a company the size of GM, successfully marketing the Bolt would pose serious competition to Tesla's plan to offer a mass-market electric vehicle. Tesla currently sells the Model S, which competes in the luxury segment, costing $70,000 or more. Tesla, which boasts a market capitalization of $25.9 billion, so far isn't profitable, even though we’re seeing more and more Teslas on the roads almost every day. The Volt vs the Bolt. Is Toyota’s Prius Losing Juice? GM's Chevy Volt, which can travel a short distance on battery-only mode, is equipped with a range-extending engine, which means that it’s basically a gas-electric hybrid like the Toyota's Prius. The Prius used to be the big dog on the scene, but the Volt stole part of their thunder and now the Bolt may capture even more of the market rather soon. If Toyota is worried, they aren’t showing it, but if they are to compete with these newer electric cars, they better get to work in their research and development endeavors rather quickly. Sales of all alternative-fuel vehicles have been hit hard by the fall in gasoline prices, which undermines the premise that charging cars with electricity saves on energy costs. The Bolt should be able to out sell Nissan's Leaf, because it goes for $21,000 after federal and state tax incentives for electric vehicles, and has an average range of about 84 miles, according to GM. By more than doubling the overall range of the Leaf, the Bolt gives you twice the distance while costing only $9,000 more. To maximize the Bolt's range, it's made of lightweight materials including aluminum, magnesium and carbon fiber, according to the car manufacturer. It will allegedly also contain a wide range of new, cutting-edge technology, such as sophisticated accident avoidance systems, GPS, audio and computer connectivity in many phased of the design. GM's stock price has been stuck in neutral since its 2010 public offering following its 2009 emergence from bankruptcy. Consumers' so-called "range anxiety" has been a major stumbling block to selling electric cars, in addition to reports that electric vehicles lose their value in the market rapidly and need a new battery after heavy use. When you add in the fact that owning an electric car is still limiting, especially for those who log a lot of miles or have a lengthy commute, you can see that the Bolt will represent a real challenge for GM. 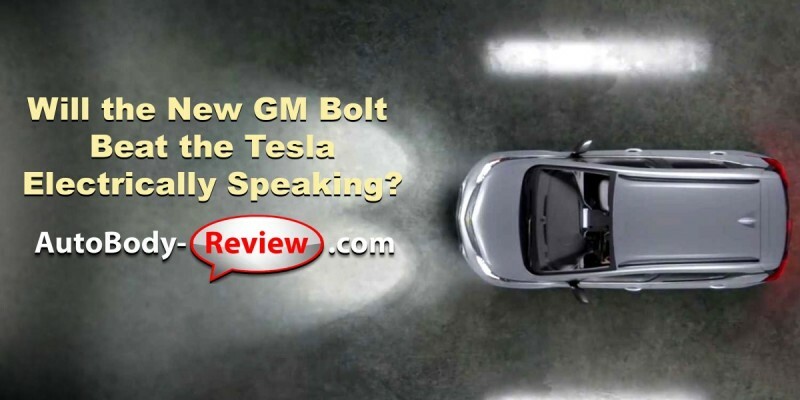 Will the Bolt become the new Prius or Volt of 2017? Only time will tell, but you can be sure that Nissan, Tesla, Toyota, GM and probably many other carmakers all over the world will be jumping into the electrical car game very soon. I was kept informed with progress updates while my vehicle was being repaired. It was a nice to see a company being proactive in communications instead of having to call and check on things repeatedly. Great service.